Hindu kings had been great inspiration for the youth of India. Historical accounts of India has several powadas, poetries, kavitas and veer vaanis describing bravery of Hindu kings. Young warriors of the kingdom that time looked up to them to fight against mlecchas; british and muslim invaders. Historical tales helped a lot in uniting Hindus across all states to retaliate against foreigners. It was this custom of sharing bravery tales of kings and queens of India which was dismantled by darbari historians of mughals and british – they glorified muslim terrorists and english looters in their badshahnamas, memoirs thereby demeaning EVERYTHING about past of Bharat including brave acts of Hindu kings and queens. The farce custom continued even post independence. We at HariBhakt.com took pledge to share our Hindu history about true heroes and Rishis in right characterization so that we can spread factual information, to make it a medium to knit all of us together. Internalizing fearless and daring stories of our kings can resurrect India as the VishwaGuru, invoking immense confidence and ferocious pride among youth of India again like Hindu Raja’s brave acts did during ancient time. Yashwantrao was a lion, one such great Hindu warrior king who never rested, he tirelessly fought against british and their pimps to establish Hindu Rashtra but as it happened earlier, fellow Hindu kings never supported him. Maharaja Yashwantrao Holkar from Hindu Empire was born in 1776. He was the son of Maharaja Tukojirao Holkar, and grandson of Malhar Rao Holkar, who had regained Attock (now part of Pakistan) in 1758 and had hoisted the saffron flag beyond the Sindhu River. 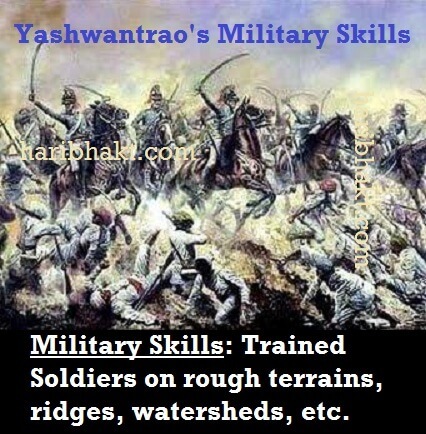 Yashwantrao Holkar being expert in military skills, administered and established major branches of the army under his personal supervision. As a defence strategist, he ranks among the foremost generals who ever fought on the Indian soil. His heroic achievements throw light on his military genius, political sagacity and indefatigable brilliance. He is undoubtedly the greatest and most inspiring figure in recent world history due to his series of victories against britishers, which was never seen in any colony of the english invasion. Yashwantrao Holkar had three brothers; Kashirao, Malharrao (II) and Vitthojirao. Kashirao Holkar was more into music, art and passtimes so lacked qualities of a ruler, but Malharrao Holkar was an able ruler and a military leader; naturally, the people and the soldiers preferred Malharrao. Malharrao, Vithojirao, and Yashwantrao opposed Kashirao and demanded that Malharrao should be the heir after Maharaja Tukojirao. Another reason was the courage, leadership, and bravery shown by Malharrao in the Battle of Lakhairi (1793), where the Holkars were defeated by the well-trained modern army of Scindia under the european savoyard general Benoît De Boigne. He stood till the last soldier fell in the battlefield, was badly wounded and fell unconscious due to heavy loss of blood. Support was growing for Malharrao, and Kashirao felt his authority was in danger—so he again sought the help of the Scindia (who were pimps of british), always hated the Holkars, due to the growing prominence and rising power of Holkars in North India. This move angered the people, as during the siege of the Kumher fort in 1754, Scindias had agreed to sign the treaty with Surajmal Jat even though Malharrao’s son Khanderao was killed during the siege. The Scindia dynasty back-stabbed several Hindu kings and queens to bootlick britishers. Betraying Malharrao on 14 September 1797, Daulat Rao Scindia suddenly attacked and killed him. He imprisoned Malharrao’s pregnant wife, Jijabai, mother of Khande Rao Holkar and Bhimabai Holkar, daughter of Yashwantrao Holkar. Nana Phadnawis condemned this, and so Peshwa Bajirao II, Scindia, and Sarjarao Ghatke imprisoned him. Yashwantrao Holkar took shelter at Nagpur’s Raghoji II Bhonsle. When Scindia learned this, he asked Raghoji II Bhonsle to arrest Yashwantrao Holkar; accordingly, Yashwantrao Holkar was arrested on 20 February 1798. Bhawani Shankar Khatri, who was with Yashwantrao, helped him to escape, and both of them escaped from Nagpur on 6 April 1798. After these incidents, bruised Yashwantrao Holkar never trusted anybody. Meanwhile, support for Yashwantrao Holkar was growing. Several close associates like Zunzhar Naik, Govardhan Naik, Rana Bhau Sinha, Balaji Kamlakar, Abhay Sinha, Bharmal Dada, Parashar Dada, Govind Pant Ganu, Harmat Sinha, Shamrao Mahadik and Jiwaji Yashwant of Holkar kingdom supported him. The Hindu king of Rajput Pawar dynasty, Anandrao Pawar of Dhar, requested Yashwantrao Holkar’s help in curbing the rebellion of one of his ministers, Rangnath; Holkar successfully helped Anandrao Pawar. In December, 1798, Yashwantrao Holkar defeated the army of Shevelier Duddres near Kasrawad and captured Maheshwar. In January, 1799, he was crowned King, as per Hindu Vedic rites (but it was as regent of infant nephew Khande Rao Holkar, he became sole ruler after the death of Khande Rao in 1807). Continuing his series of valiant battles, in May, 1799, he captured Ujjain. Vithojirao Holkar declared that he was working for Bajirao’s adoptive brother Amrutrao, who was more capable of being the Peshwa than Bajirao himself. To grow their empire, Yashwantrao Holkar started a campaign towards the north, whereas Vithojirao started a campaign towards the south. Bajirao II sent Balaji Kunjir and Bapurao Ghokale to arrest Vithojirao Holkar to combat his support against enemy brother Amrutrao, and in April, 1801, Vithojirao was arrested and taken to Pune. On the advice of Balaji Kunjar, Minister of Affairs, he was sentenced to death under the feet of an elephant. His wife and son Harirao were imprisoned. The well-wishers of the Maratha Confederacy warned the Peshwa not to take such a drastic step, as it would lead to the collapse of the Maratha Confederacy; but Bajirao II Peshwa ignored it. 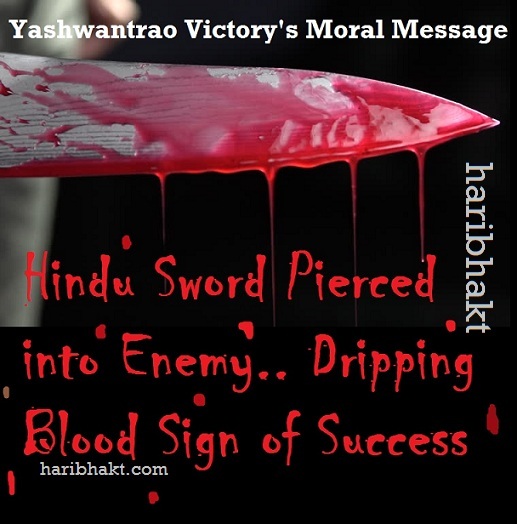 When Maharaja Yashwantrao Holkar learned this, he vowed to take revenge. The Battle of Ujjain took place on 4 July 1801, Maharaja Yashwantrao Holkar attacked Scindhia’s capital Ujjain, and after defeating Scindhia’s army led by foreigner general John Hessing, extorted a large sum from its inhabitants, but did not ravage the town. In this war nearly 3,000 soldiers of Scindhia’s army were killed. The Holkar’s victory was an embarrassing defeat for the Scindhia. In May 1802, Maharaja Yashwantrao Holkar marched towards Pune. He kept on corresponding with the Peshwa, to whom he put forward the following propositions, which, if agreed to, would put an end to hostilities. 1. (Traitor) Scindia to release the son of Malharrao. 2. Recognizing (his nephew) son Khanderao as the head of Holkar family in place of Kashirao. 4. Allotment by Scindhia to the Holkar, the share of territories in North India as settled in Malharrao Holkar’s time. On Sunday, 25 October 1802, on the festival of Diwali, Yashwantrao Holkar defeated the combined armies of Scindia and Peshwa at a Battle of Pune in Ghorpadi, Banwadi, and Hadapsar. When the Peshwa learned that he was defeated, fled from Pune via Parvati, Wadgaon, to Sinhagad. Maharaja Yashwantrao Holkar asked the Peshwa to return to Pune. If Maharaja Yashwantrao Holkar wanted to arrest the Peshwa, he would have arrested him; but he sent food to Peshwa so that he didn’t suffer. On the other side, the british offered Bajirao II enticements to sign the Subsidiary Treaty in return for the throne. After deliberating for over a month, and after threats that his brother would otherwise be recognised as Peshwa, Bajirao II signed the treaty, surrendering his residual sovereignty and allowing the english to put him on the throne at Poona. This Treaty of Bassein was signed on 31 December 1802. The british also had to check the French influence in India. They feared that if they had not adopted measures for the restoration of the Peshwa’s authority, Yashwantrao Holkar would have either attacked the Company’s territories, or those of their ally the Nizam of Hyderabad. They felt therefore the restoration of the Peshwa under the protection of the british power was a measure indespensably requisite for the defence, not only of the territories of their allies, but of their own possessions bordering on the Marhatta dominions in the peninsula of India. The flight of Peshwa left the government of Maratha state in the hands of Yashwantrao Holkar. After conquering Pune, the capital of Hindu Maratha Empire, Yashwantrao Holkar took the administration in his hands and appointed his men. He appointed Amrutrao as the Peshwa. All except Gaekwar chief of Baroda, who had already accepted british protection by a separate treaty on 26 July 1802, supported the new regime. He freed Phadnawis, Moroba, Phadke, etc., who were imprisoned by Bajirao II and went to Indore on 13 March 1803. The british reinsted Bajirao II as the Peshwa at Pune on 13 May 1803, but soon the Peshwa realized that he only has title of Peshwa, british bluffed him and took total control. On 4 June 1803, Raghuji Bhosale, Daulatrao Scindia, and Maharaja Yashwantrao Holkar met at Bodwad and decided to jointly fight against the british. However, the just demands of Yashwantrao Holkar were not fulfilled, and he was betrayed again. Daulatrao Scindia wrote a letter to Bajirao II and stated that they need not worry about Yashwantrao Holkar, as they only should show that they would fulfill the demands of Yashwantrao Holkar, and once they defeat the british, they will take their revenge against Holkar. However, the letter reached the hands of Amrutrao, being under influence of british, forgetting the support he got from Yashwantrao Holkar, he handed the letter over to General Wellesley; Wellesley sought this opportunity to cunningly incite Holkar, he immediately sent the letter to Maharaja Yashwantrao Holkar. It is said the whole letter drama was a british set-up and Daulatrao Scindia was playing in the hands of british to dismantle Hindu unity. Maharaja Yashwantrao Holkar decided not to be a part of Maratha Confederacy. Again the old ploy of british worked here, they were signing up treaties with several Maratha kings while isolating Yashwantrao Holkar. 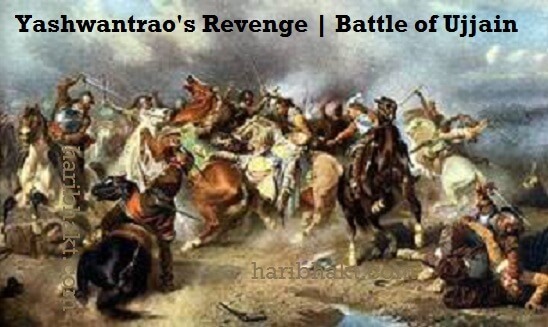 The main target was to weaken the united strength of Marathas and Rajputs. Yashwantrao Holkar’s series of victories in regaining Sendhwa, Chalisgaon, Dhulia, Malegaon, Parol, Ner, Rahuri, Nashik, Sinnar, Dungargaon, Jamgaon, Pharabagh, Gardond, Pandharpur, Kurkumb, Narayangaon, Baramati, Purandhar, Saswad, Moreshwar, Thalner, and Jejuri forced british to sign up treaties with adjacent states. They could not fight against Yashwantrao Holkar but also wanted to control parts of India. British lost the brilliance of fighting battle in front of bravery and military skills of Holkar. On 17 December 1803, Raghuji Bhonsale II of Nagpur signed the Treaty of Deogaon with the british after the Battle of Laswari and gave up the province of Cuttack including Balasore. On 30 December 1803, the Scindia signed the Treaty of Surji-Anjangaon with the british after the Battle of Assaye and ceded to the british places between Ganga-Jamuna daob, the Delhi-Agra region, parts of Bundelkhand, Broach, some districts of Gujarat, fort of Ahmadnagar (was captured by Holkar earlier). Gaekwad of Baroda had already signed a treaty on 29 July 1802. It became 34-year-old Wellesley’s first major success, and one that he always held in the highest estimation, even when compared to his later triumphant career. According to anecdotal evidence, in his retirement years, Wellington considered the Battle of Assaye his finest battle—surpassing even his victory at the Battle of Waterloo. On 20 December 1803, General Wellesley, in one of his letters, highlighted the importance of signing treaties, stated that it was necessary to curb the rising power of Yashwantrao Holkar as he was brave, fearless, courageous, and ambitious. Maharaja Yashwantrao Holkar wrote letters to different kings to unite and fight against the british. He stated, “First Country, and then Nishtha. We will have to rise above Jaati, Nishtha, and our states in the interest of our country. You too must wage a war against the british, like me.” His appeal fell on deaf ears, as all of them had already signed treaties with the british. Lake and Wellesley always discussed ways to tackle Yashwantrao Holkar. On 4 April, Lake forwarded some intercepted correspondence of Holkar, which he was said to have been carrying on with the other Indian chiefs of Hindustan to forge an alliance against the British. Lord Wellesley needed no fresh argument to justify his war against Holkar. 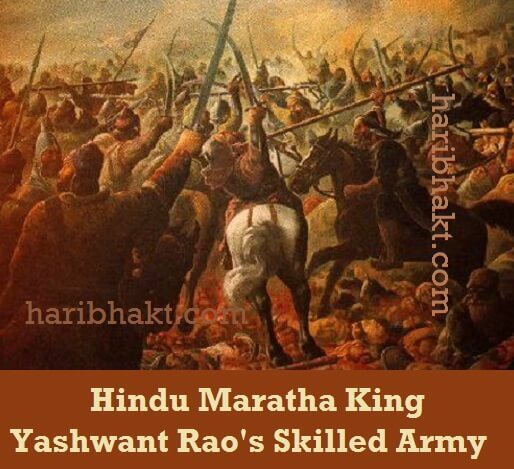 Maharaja Yashwantrao Holkar defeated the mlecchas, british army, led by Colonel Fawcett, at Kunch, in Budhlekand. On 8 June 1804, the Governor General, in a letter to General Gerard Lake, wrote that the defeat caused a great insult. This would endanger the company rule in India, and hence Yashwantrao Holkar should be defeated as soon as possible. For the first time, a braveheart king was showing decisive resistance to british invasion, they were fearing to lose grip of India forever. No Hindu king or muslim invader before Yashwantrao Holkar showed confrontation that was weakening british’s control. 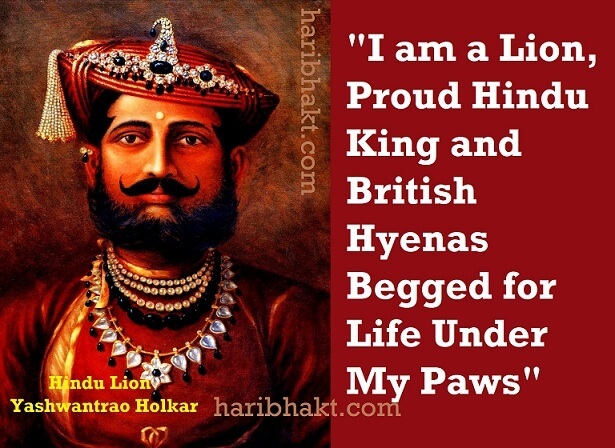 He was Hindu lion hunting down the english hyenas. On 8 July 1804, Maharaja Yashwantrao Holkar defeated the army of Colonel Manson and Leukan at Mukundare and Kota. Bapuji Scindia surrendered before Maharaja Yashwantrao Holkar. From June till September 1804, he defeated the british at different battles. British colonels were changing, Holkar was only common in these battles. His energy to fight british made them awestruck and frightened. They were attacking from different places. To strengthen his army, on 8 October 1804, Maharaja Yashwantrao Holkar attacked Delhi to free muslim invader Shah Alam II, who was imprisoned by the british. He attacked the army of Colonel Actorloni and Berne. The battle lasted for a week, but Yashwantrao Holkar could not succeed as General Lake came to help Colonel Actorloni. Assessing the situation, he changed the plan, and postponed it. Admiring his bravery, Mughol Emperor Shah Alam gave him the title of “Maharajadhiraj Raj Rajeshwar Alija Bahadur”. Colonel Marey and Wallace captured Indore and Ujjain on 8 July 1804. 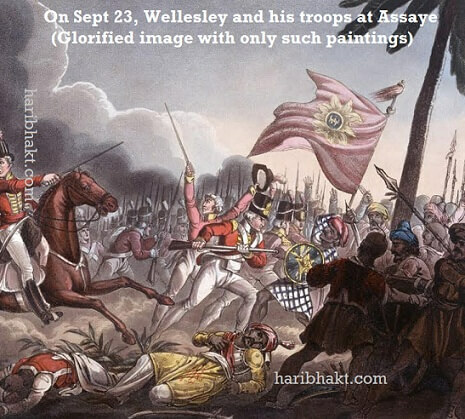 On 22 August 1804, Wellesley marched against Holkar from Pune, along with Bajirao Peshwa’s army. In Mathura Maharaja Yashwantrao Holkar learned that the British had captured some of his territory; he decided to stay in Mathura and work out a strategy to regain his territory. In a letter dated 11 September 1804 written to Lord Lake, Wellesley said that if Yashwantrao Holkar was not defeated at the earliest, the rest of the Kings of India may unitedly stand against the British. The supremacy of Yashwantrao shocked britishers, they were startled even after signing treaties and taking help of several Hindu kings and muslim invaders, they could do no harm to the fearless warrior and his army. Bajirao Peshwa was once pardoned by Yashwantrao for Hindu unity but he kept licking insult inflicted by britishers, working for them as a pawn. On 16 November 1804, Maharaja Yashwantrao Holkar reached Deeg by defeating the army of Major Frazer. After the death of Major Frazer, Manson took the charge of the british army. The Jat King Ranjit Singh of Bharatpur welcomed him and decided to be with Maharaja Yashwantrao Holkar against the british. In Farrukhabad, Lake was frightened and a mute spectator watching Yashwantrao Holkar proceeding towards Deeg; he didn’t dare attack Maharaja Yashwantrao Holkar. The Governor General was disappointed by this conduct of Lord Lake, and he wrote to him about his disappointment. Fear of losing grip of british on India was giving sleepless nights to english. Hindu defiance of Holkar dinted the over-confidence of british to the core beyond repair. Lord Lake attacked Deeg on 13 December 1804 whereupon the army of Holkar and Jat successfully resisted and reached Bharatpur. Lord Lake attacked on 3 January 1805, along with General Manson, Colonel Marey, Colonel Don, Colonel Berne, Major General Jones, General Smith, Colonel Jetland, Setan, and others. The subsequent siege of Bharatpur lasted for three months and was compared with the war described in the epic Mahabharat. Many poems on this war were written, praising Maharaja Yashwantrao Holkar. British knew they will never be able to defeat brave Maharaja Yashwantrao Holkar. It is time to further decimate his strength by invoking DIVIDE-RULE policy. To divide the native kings, the british declared that they would distribute the territory of Holkars amongst it’s Indian friends. Maharaja Yashwantrao Holkar had become well known throughout India, due to his bravery, however, Amir Khan (Pindari) and Bhawani Shankar Khatri betrayed him. The British gave the Jahagir of Tonk to Amir Khan Pindari, and a Mahal and a Jahagir in Delhi were given to Bhawani Shankar Khatri. Bhawani Shankar Khatri’s Haweli, situated in Delhi, is even today referred to as Namak Haram ki Haweli (Traitors House). The place was abandoned during his regime by the local people, they abused Khatri with cuss words and cursed him. Daulatrao Scindia decided to help Holkar, but was prevented from doing so by the ill advice of Kamal Nayan Munshi who was british stooge. Even Ranjit Singh later betrayed Yashwantrao, any other king would have surrendered after series of betrayals from fellow Hindu kings but Yashwantrao Holkar was truly a winner, he believed in himself, his army, his leadership skills and Hindu pride. The dedication and belief alone made him half victorious before the battle was fought. Sir P.E. Roberts states that surprisingly, the Jat King Ranjit Singh signed a treaty with the British on 17 April 1805, when they had nearly won the war. Due to this, Maharaja Yashwantrao Holkar had to leave Bharatpur. The failure of General Lake to conquer the fort of Bharatpur shattered the myth of invincibility of british arms, and raised the fears about the revival of Maratha Confederacy against Wellesley’s wars of aggression in India. This came as an anti-climax to Wellesley’s ‘forward policy’. First time someone was kicked due to heroics of native Hindu king. The british Prime Minister was therefore constrained to retort that “the Marquis had acted most imprudently and illegally, and that he could not be suffered to remain in the government”. Thus Wellesley was recalled. Maharaja Yashwantrao Holkar, Daulatrao Scindia, Satara Chattrapati, and Chatarsinh met at Sabalgad. It was decided that, united, they would uproot the british from the Indian soil. In September 1805, Holkar and Scindia reached Ajmer. Maharaja Man Singh Rathore sent his army to support them. Maharaja Yashwantrao Holkar sent letters to the rest of the kings of India, appealing to them to fight against the british. The King of Jaipur, Bhosale of Nagpur, Ranjit Singh of Punjab, accepted his appeal. When the british learned that Holkar and Scindia were united, they informed Lake again to pursue them. On 25 April 1805, frightened Lord Lake replied to Governor General Wellesley and stated that he was unable to pursue them and that Holkar felt great pleasure killing the Europeans; Governor General Wellesley replied that all disputes with Holkar be resolved without any war. The British were worried because of the continuous failure against Holkars. They felt that Maharaja Yashwantrao Holkar would drive the East India Company out from India. They were foreseeing Maharaja of India in Yashwantrao’s series of heroic victories. Wellesley was terminated and Lord Cornwallis was appointed as the Governor General of India. As soon as he came to India, he wrote to Lord Lake on 19 September 1805 and stated that all the territory of Yashwantrao Holkar be returned and that he was ready to make peace with Holkar. Holkar refused to sign any treaty with the british. George Barlow was appointed as Governor General, due to the sudden death of Lord Cornwallis. Barlow immediately tried to divide Holkar and Scindia. The british signed a treaty with Daulatrao Scindia through Kamal Nayan Munshi on 23 November 1805, and in this way, Holkar was left alone to fight with the british. Greed over pride got even Sikhs encapsulated. Along with muslim invaders and Hindu kings, Sikh rulers also betrayed Maharaja Yashwantrao Holkar. He tried to create an alliance with Raja Bhag Singh of Jindh, Raja Fateh Singh of Kapurthala, and other Sikh rulers against british; but could not succeed. Maharaja Ranjit Singh of Lahore initially agreed to join Maharaja Yashwantrao Holkar, but Maharaja Ranjit Singh’s (Lahore, Punjab) letter dated 1 August 1804 addressed to Maharaja Yashwantrao Holkar was intercepted by the British at Mathura. As soon as the british learned this, they sent Bagh Singh, uncle of Ranjit Singh, to prevent Ranjit Singh from supporting Maharaja Yashwantrao Holkar. The british requested Ranjit Singh to immediately break off all communications with the Maratha. Behaving like a british stooge, Ranjit Singh and Fateh Singh shamelessly signed a friendship treaty with the british (The Treaty with Lahore). The agreed draft of this treaty was ready on 17 December 1805. Subsequently, Maharaja Ranjit Singh turned down Holkar’s request to fight against the British. Yashwantrao was deeply pained as Hindu Marathas protected Sikhism and their people hundred times from muslim invaders and british attacks. Similarly, Hindu kings including Yashwantrao saved Bharatpur several times but Sikhs helped british to defeat him, this was their response to good deeds of Hindus. Maharaja Yashwantrao Holkar cursed Ranjit Singh; this curse became a saying in Punjab. The british Council told Lord Lake to make peace with Maharaja Yashwantrao Holkar at any price, because if they were late and the other kings accept the appeal of Maharaja Yashwantrao Holkar, it would be difficult for them to remain in India. 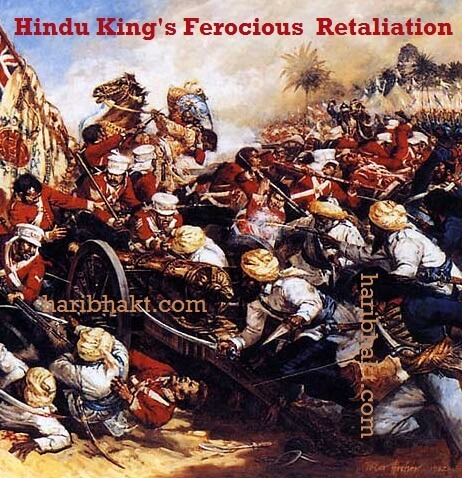 Hindu king’s aggressive stance rattled britishers, they were out of ideas and strategy, series of treaties with other kings did not help, entire british regime could never match the courage of this tireless Hindu king. The british commander halted after crossing the boundary-line of Alexander’s conquests and encamped his troops on the banks of the Hyphasis (the Beas) within the reach of the troops of Holkar, where, upwards of two thousand years before, the veterans of the Macedonian conqueror had pitched their tents after the Battle of the Hydaspes where Alexander and his army finally gave in and returned by securing the banks of the river as the borders of his empire and refused to go further into India. Later Chandragupta Maurya had recaptured the Macedonian territories in India. Even Chengis Khan’s Mongol invasions of India could not cross this boundary-line and were repulsed by Indians. He was a man of self-respect. He was the only king in India whom the British approached with an unconditional peace treaty as per the London policy of withdrawal. It was not a Treaty of Subsidiary alliance that the british had entered with others. Maharaja Yashwantrao Holkar saw that the rest of the kings were not ready to unite and were interested in personal benefits. He tried hundreds of times sending thousands of letters and messages to Hindu kings, Sikh rulers and muslim invaders but except few all were happy to be the lapdogs of british. Eventually, he was the last to sign a treaty with the british, on 24 December 1805 at a place called Rajpur Ghat on the bank of Beas River. The treaty was named ‘The Treaty of Peace and Amity between the British Government and Yashwantrao Holkar.’ The british recognised him as a sovereign king and returned all his territories and possessions, and accepted his dominion over Jaipur, Udaypur, Kota, Bundi, and some Rajput kings. They also accepted that they would not interfere in the matters relating to Holkars. The treaty was duly ratified by the Governor-General George Barlow in Council on 6 January 1806 and later duly amended on 2 Feb 1806 on the Banks of River Ganges Rajghat. (The Treaty of Rajghat)(London policy of withdrawal). Thus he got his demands fulfilled and successfully resolved the disputes with Shinde, Peshwa and the British. The Victorious king reached Indore and started ruling his kingdom by declaring that he had saved his ancestral State. The King of Jodhpur always helped Holkars. Lord Lake denounced the abandonment of Indian allies by the Company, resigned his post in protest, and returned to England. In a letter dated 14 March 1806 addressed to Mr. Sherer, Charles Metcalfe, 1st Baron Metcalfe, who witnessed the treaty, states, “But why do I constantly harp upon the character of our Government? I believe it is because I am compelled to feel that we are disgraced; and that Holkar is the prevailing power in Hindustan.” Mr. Metcalfe many years later looking back admitted that the measures adopted by Sir George Barlow were necessitated and it was hardly possible to have followed any other course. Maharaja Yashwantrao Holkar again tried to unite the Maratha Confederacy and wrote to Daulatrao Scindia about this. However, Scindia gave the information about this letter to british resident Marsor, who appraised the Governor General about this on 12 May 1806. Holkars and Scindias agreed on 11 points on defensive and offensive strategies on 14 November 1807; however, the british once again succeeded to divide Scindias from Holkars. Deceitful british got their own medicine, signing of treaty was not honored by Hindu king for the first time, as he and natives of Bharat had first right over Indian soil and not english invaders. 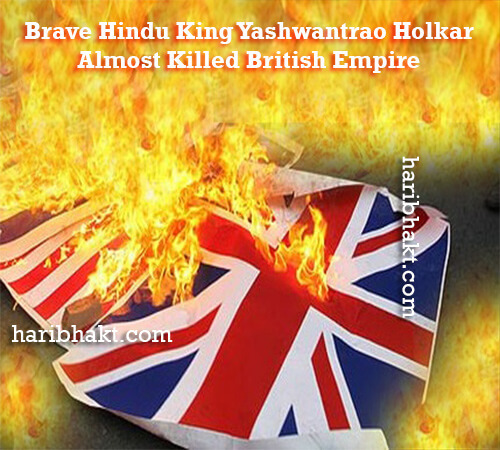 Hindu Rashtra was a bigger dream than bogging down to cunning politics of britishers, finally, Maharaja Yashwantrao Holkar decided to fight with the british singlehandedly and drive them out of India. He decided to stay in Bhanpura to gather a large army and manufacture cannons to defeat the british. He was successful in keeping the british out of his state, but he wanted them out of India. He knew that this was impossible without sufficient cannons, so he built a factory to manufacture cannons in Bhanpura. For this reason he is also referred to as the “Father of Modern Indian Army”. He worked day and night and manufactured 200 short and long range cannons. He gathered an army of 1 lakh soldiers to attack Calcutta. The stress of the work and the deaths of his nephew Khanderao Holkar on 22 February 1807 at Shahapura and Kashirao Holkar in 1808 at Bijagad lead to a stroke, from which he suddenly died at Bhanpura (Mandsaur, M.P.) on 27 October 1811 (Kartiki Ekadashi) at the young age of 35 years. The most probable cause of his death is due to excessive Blood Pressure and Stress. By early 30’s, Yashwantrao’s fearless valor and zeal to establish Hindu Rashtra made him King of kings in India. His battles were the most remarkable in the History of Indian Wars and the title given to him by the enemy mughal emperors gave him a prominent position amongst the rulers of India. 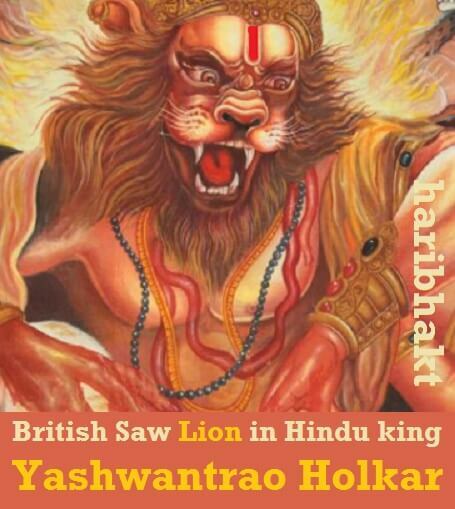 There are numerous accounts shared by british and mughal historians praising the bravery of Hindu Lion Yashwantrao Holkar. Maharaja Yashwant-Rao Holkar started the first freedom struggle in 1803; he was a gifted military leader. If the Battle of Assaye was Wellesley’s first major success, and one that he always held in the highest estimation as his finest battle, surpassing even his victory at the Battle of Waterloo, then the victory at the Battle of Bharatpur undoubtedly makes Maharaja Yashwantrao Holkar the Napoleon of India and unarguably Napoleon the Yashwantrao Holkar of France. The life of Yashwantrao teach us about Hindutva pride, unity, respect, love for Bharat Mata. 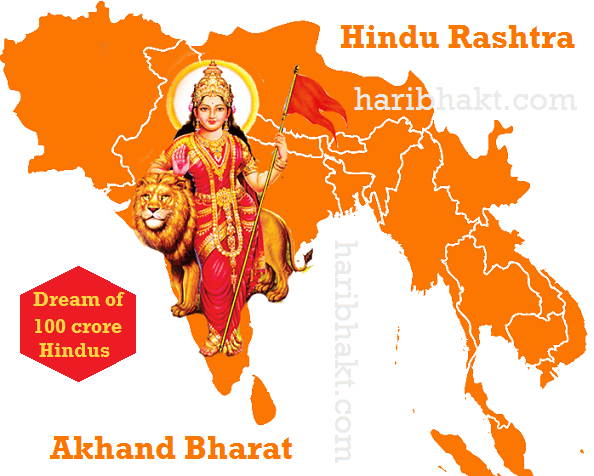 You have read the complete post, this shows your quest for Hindu pride and your vision for resurrection of Hindu Rashtra which cannot happen unless we all Hindus know our true potential. Historical past give insights about our capability. Generals and soldiers of Yashwantrao Holkar’s army were our ancestors, our forefathers. We have same DNA and blood flowing in our veins. It is time for us to do our duty by sharing this post with all Hindu friends we know on this earth including well-wishers and our family, relatives. Share this article and work towards Hindu unity. This post is a humble tribute to the Brave Hindus who fought ferociously to save Indians for the last 1000 years from mleccha invaders; muslims, british, french and foreigners. Be always Brave and Aggressive. Share the post and invoke bravery among Hindus. Details are sent to your email id.